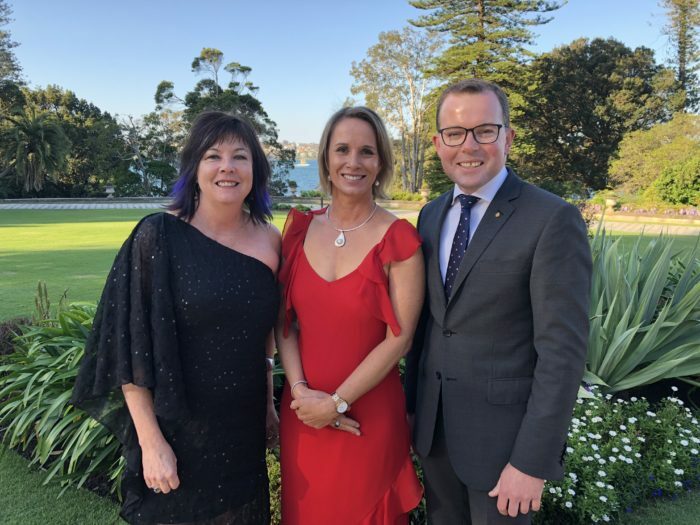 Moree TAFE teacher Elizabeth Von Gavel, centre, was named Non-Aboriginal teacher of the Year at yesterday’s TAFE NSW Gili Awards in Sydney, she is flanked by Belinda Pring, left, and Northern Tablelands MP Adam Marshall. NORTHERN Tablelands MP Adam Marshall has praised the efforts of local award winners from the Moree campus of TAFE NSW who have been acknowledged for their achievements at the prestigious statewide Gili Awards in Sydney yesterday. Mr Marshall, who is also the Minister responsible for TAFE NSW, congratulated Elizabeth Von Gavel and former Boggabilla student Falau Paul Talbot, as well as the Moree TAFE and Wee Waa Aboriginal Lands Council who were recognised for their education and training achievements. Mr Marshall said the TAFE Gili Awards celebrated Aboriginal students, teachers and employees and the northern award winners epitomised the very spirit and outstanding efforts of the awards philosophy. Mr Marshall said he was proud and honoured to see Liz Von Gavel awarded the Non-Aboriginal Staff Award, and Moree TAFE and Wee Waa Aboriginal Lands Council, which together received the Community Partnership Award. Also recognised at the awards ceremony was Apprentice of the Year Folau Paul Talbot, who moved from Boggabilla to study at TAFE NSW in Sydney. “Lizzie’s career in Vocational Education and Training (VET) commenced in 2003 as a Visual Arts Teacher in Moree,” Mr Marshall said. “In addition to leading training delivery across the West Region, one of Lizzie’s greatest achievements is the planning, development and coordination of the Mehi Art Studio and Gallery at TAFE NSW Moree. Mr Marshall said Lizzie had also established a similar Aboriginal student gallery called Bulaarr Bagaay (Two Rivers) Studio at Boggabilla TAFE, which offers products and services locally supplied by the community and is supported by Boggabilla and Toomelah Elders. “Lizzie also recently designed a cultural tourism certificate for Boggabilla, featuring activities including guided tours, arts and crafts, performance and nature-based experiences,” Mr Marshall said. As part of her commitment to partnership, Lizzie employs Aboriginal teachers to deliver a range of courses incorporating the local Gamilaroi language into some of the art courses. “In developing her classroom tools and delivery programs, Lizzie consults with the local Aboriginal community and Elders to ensure her teaching practices and resources are culturally appropriate,” he said. And Mr Marshall said the naming of Folau Paul Talbot was a fitting acknowledgement of a proud Gamilaroi man from Boggabilla, the first in his family to complete Year 12 and go on to even more statewide honours. “Paul is quite the hero of his hometown now and it is so well deserved,” Mr Marshall said. “Paul initially completed studies in Dental Assisting through a scholarship with the POCHE Centre for Indigenous Health, through which he completed his Certificate III in Dental Assisting. “After that, he went on to complete his Certificate IV in Dental Assisting in Oral Health and Radiography but he has also completed his Diploma in Dental Technology. “Paul now works as a Scholarship Mentor with POCHE Centre for Indigenous Health at Sydney University, mentoring and organising the scholarships for all the new dental scholars in the program. Mr Marshall said the awards recipients were a testament to the real and significant change that training provided by TAFE NSW brings to the lives of Aboriginal people across NSW. “It is providing pathways for Aboriginal students into further study and satisfying careers and bringing benefits to many regional areas,” he said. Mr Marshall said Gili was an Eora word that means ‘to shine’ and this year’s recipients had all embraced the spirit of these awards through their hard work, talent and ambition.